MANHATTAN — The prolific restaurateur Danny Meyer — of Gramercy Tavern and Eleven Madison Park fame — has stepped down as co-chair of the Union Square Partnership's board of directors after five years at the helm. 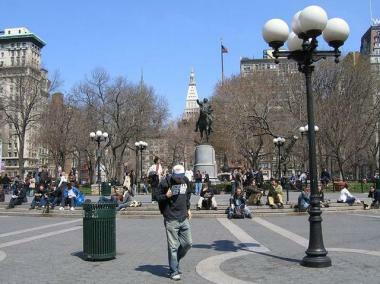 He and attorney Eric Seiler had been co-chairs since 2006 and will remain on the board of the non-profit that oversees Union Square Park. The pair were replaced with Lynne Brown, New York University's senior vice president for university relations and public affairs, and Carole Sobin, an attorney for Consolidated Edison. The shake-up was announced at the organization's 27th meeting last week, where leaders paid tribute to the departing co-chairs. "Many districts in the city have seen vacancies increase and pedestrian traffic decrease," said Jennifer Falk, the partnership's executive director, in a statement. "Union Square has seen the opposite and that is due in part to the work of Danny and Eric." She was excited for the "next chapter" with Brown and Sobin. Meyer and Seiler's predecessor, Eugene McGrath, was also from Con Ed. The utility operates a utility plant nearby on E. 14th Street and the East River.